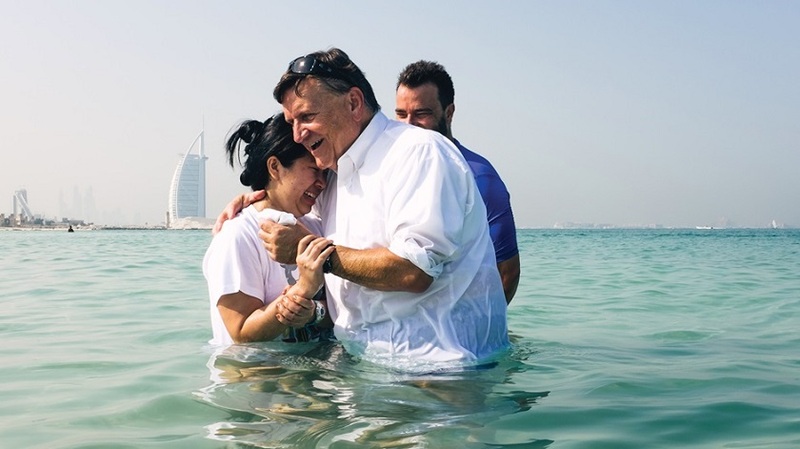 Public baptism service in the Gulf, in front of Dubai’s Burj al-Arab. Photo courtesy of Fellowship of the Emirates. Espada, an architect, is one of the millions of foreign workers transforming the former desert oasis into a global center for business and travel. The UAE’s Dubai is the fifth-fastest-growing city in the world; its population is now more than 80 percent migrant. The great majority of migrant workers in the region come from India and Southeast Asia, sometimes suffering exploitation in labor camps to send a collective $100 billion back home. As an American, Espada is unusual. But as a Christian, he is not. Today the Pew Research Center numbers Christians in the Arabian Peninsula at 2.3 million—more Christians than nearly 100 countries can claim. The Gulf Christian Fellowship, an umbrella group, estimates 3.5 million. These migrants bring the UAE’s Christian population to 13 percent, according to Pew. Among other Gulf states, Bahrain, Kuwait, and Qatar are each about 14 percent Christian, while Oman is about 6 percent. Even Saudi Arabia, home to Islam’s holiest cities (Mecca and Medina), is 4 percent Christian when migrants are counted. Together, they represent the largest Christian community in the Middle East outside of Egypt. But their experiences vary considerably. In Bahrain and Kuwait, Muslims can enter church compounds. In Qatar, guards allow only foreigners. Saudi Arabia’s Grand Mufti (the nation’s highest official of religious law) has called for all churches in the peninsula to be destroyed. Surprising to many observers is how many of these churches there are. Please click here to read the full article at Christianity Today. Next post I’ll share some photos of church buildings. Very interesting. Would be curious to hear anything about conversions from Islam, if there are indeed any taking place.